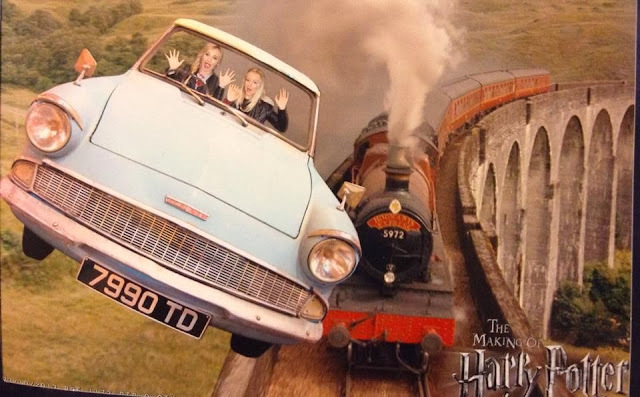 I LOVE HARRY POTTER and this week was super super exciting for me as I got to go to the Warner Bros Studios in Watford and go on the Harry Potter Studio Tour. This is something I have been wanting to do since it opened so when my friend and I spontaneously booked the trip a few weeks ago I couldn't have been happier! I have to say if you are a Harry Potter fan this is something you just HAVE to do! The amount there is just so exciting and fascinating and all the staff are amazing at their job and try and make the experience as perfect as they can for you! So I thought I'd share a few photos with all all of my adventure at the Studio (not all 300 that I took don't worry!) - if you aren't a HP fan I'm sorry but if you are.... you will understand my excitement! Even though we rocked up 2 hours early for our booked tour *opps! * we were able to get straight into the main queue and wait for the next tour which worked out fantastically for us (as we don't live that close)! 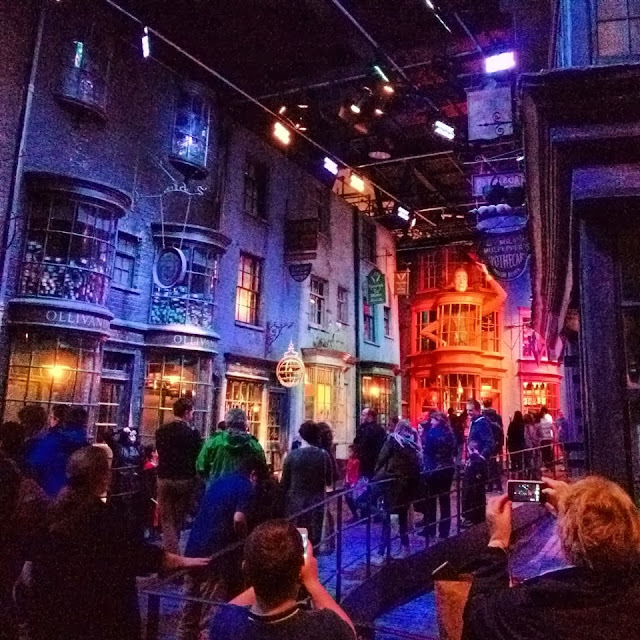 The Cupboard Under The Stairs - Loved being able to check this out whilst waiting in the queue to enter the tour. The Yule Ball Costumes - Costumes from the 4th movie, Emma Watson has got to be so so tiny! Wigs, hair and make-up - obviously this is something which majorly interested me! The amount of detail that had gone into everything was just astonishing. From full-heads of hair to eyebrows to chest hair - it was all there on display, amazing. Hogwarts Entrance Gates - A lovely member of staff offered to take a photo of the both of us - I love it! Potion's Classroom - A lot of facts about this set which were really interesting. One being that it wasn't always used for the classroom and has been in lots of the other movies as different sets! The Half Blood Prince's Book - An iconic prop from the 6th movie. Dumbledore's Office - This was stunning, can you spot the 2 Dumbledore's? Muggle Statue - I was always hoping this was going to be on display here. It looks amazing in the movies and I really wanted to see it in real life. The detail and work that has done into this is incredible. The Chamber Of Secrets Entrance - Another iconic part of set - I'm sure you all recognise this. Green Screen Experience - This was really fun, we got to film a little video and pose for a photo with a green screen, super clever stuff and we didn't have to queue for long! Of course we had to get the photo each, it was £8 but so worth it! 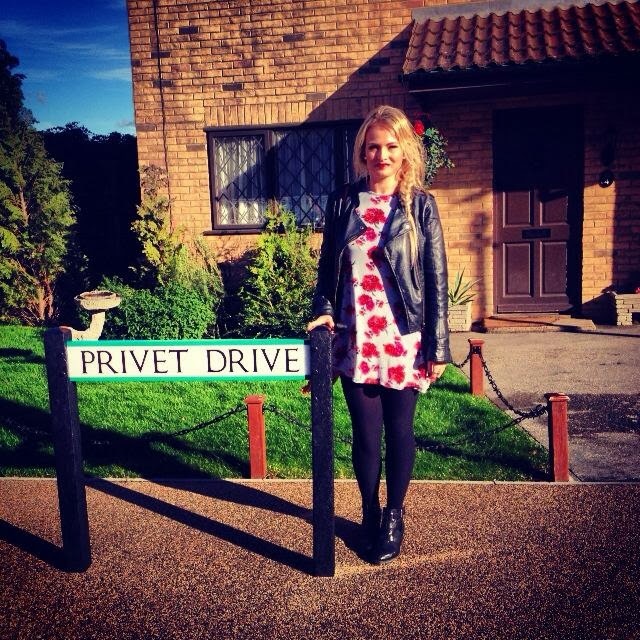 Number 4 Privet Drive - This was one of the sets that was outside and one of my favourites - we were so lucky the sun was shining for us! The Hogwarts Bridge - For some reason it was closed which was a shame, normally you can actually walk through it, but it was still really cool to see it in real life. Diagon Alley - as it was Halloween week the alley had been taken over my Death Eaters, can you spot one? Hogwarts - By far my favourite part of the tour - the model of Hogwarts is bigger than you would ever imagine it too be, it is incredible. It goes through day to night every few minutes or so, so you can see it at all times of day. Beautiful. I have soooo many more photos but I won't bore you with them all! Have any of you guys been? I cannot wait to go back! Wow I'm so jealous, I don't understand why I haven't been yet :( I need to go! YAY! I'm so glad you had a good time! 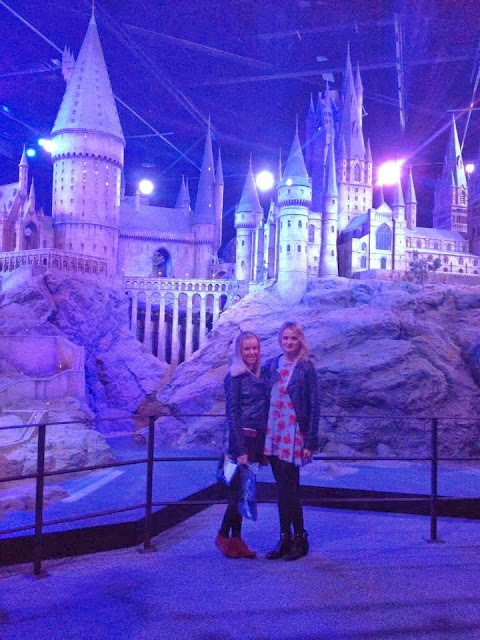 We never made it to the green screen experience as it was far too busy :( Still got lots and lots of photos though. Can't wait to see your haul from the gift shop! I've been here twice now and NEED to go again. I saw so much more things the second time around, the first time I went it was one of the later tours so there was literally about 20 people walking around which was FANTASTIC, we got to see so much without having to fight past loads of people - I took so many pictures my batteries died, I had to result to using my phone - which when I left had 2% battery. Not even sorry. But because the first time I had the chance to see loads and have the staff on hand to point little things out, the second time I could look for things I'd missed completely the first time. Meaning MORE photos needed to be taken. I think from the two trips I have 1000 pictures. Haha. Have some great footage too, just need a good video editor to put them together now. That's so cool they had Death Eaters around Diagon Alley. I'd have loved that. Have you seen they're turning it Christmas-y from the middle of Nov? Snow over the model, Christmas Decorations and Trees in the Great Hall. AH I desperately need to go and see it like that. Did you like the Wand room? I spent HOURS in that room finding everyone. I had to ask the guy in there where David Tennant was (His wand box is bigger on the inside apparently - according to the dude who worked there. I wanted to marry him there any then haha!) because I am too short to see, it was one of the higher ones and a box underneath was sticking out so was impossible to see, but ahhh I had so much fun finding people in that room. Me and my friend stumped him, he said he knew where everyone's box was in that room so we asked him where the guy who played Albert Runcorn's (David O'Hara) box was... we just said Albert Runcorn to try and make it more difficult. He had no idea and had to check his book, apparently the only time he had to check it since the tour opened. Proud moment. Haha. I'm so jealous, I've been wanting to go for ages! Glad you had a good time, that picture in the car looks brilliant! I went just the other week and I absolutely loved it! So lovely that you got to go in the sunshine though- I went at night time when it was dark and cold so seeing Privet Drive was a short experience for me lol. Looks just magical, thanks for the wonderful images!